Brushing your Teeth to avoid bad breath when you are on the move either on a vacation or on a business tour has been a problem which everyone faces. To bush your teeth with the usual tooth brush requires a common tooth brush, toothpaste and water, which can be difficult to find during your camping trip or on the road trip. Ideal to use after eating, at work, at school, during travel. Wipe teeth, gums and tongue. No water or rinsing necessary. Special moisture shield – helps keep finger dry! So for these situations there are Oral-B Brush Up’s which can be used anywhere anytime without requiring any water tooth brush or tooth paste. These can be used even on children as most of the small children do not prefer brushing , where this can come pretty handy. Thank you for sharing this. 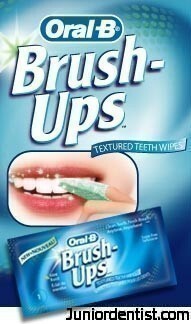 Oral-B Brush Up’s is good because we can easily bring that and easy to use. Keep posting! is it replacement of toothbrush and paste in day to day life…..? Toothbrush and Tootpaste are the Best for maintaining Oral hygiene, this is just an alternative for travelers of small children where the use of toothbrush and paste is not possible.